The ongoing adoption of cloud computing by communications service providers (CSPs) continues to fundamentally reshape their business models and technology strategies on several levels. One such area that is garnering significant attention is the impact of the cloud on security services. This is because security services and the vital tools they encompass can be empowered through the adoption of a carrier cloud model. This, in turn, better positions CSPs to meet the demands of their customers, including those in the small to medium-size business (SMB) market segment. The timing of this migration is optimal, since many SMBs now recognize the threats they face and realize that given their limited IT budgets and lack of security expertise, CSPs are well positioned to protect them from cyberattacks. 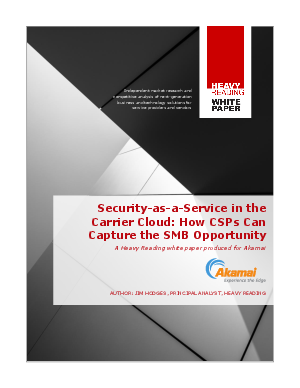 While the opportunity for CSPs is significant, many are hesitant to make a move in this area because they want to ensure they can address SMBs’ needs and maintain control of the service in a carrier cloud. We believe the answer lies in focusing on the implementation of a seamlessly integrated suite of security-as-a-service (SECaaS) capabilities that make it simple for SMBs to adopt services and operationally efficient for CSPs to deploy and manage them at any scale. Accordingly, this paper examines the potential business opportunities associated with cloudbased SECaaS for SMB customers, as well as the technical and architectural considerations that CSPs must embrace to create a cohesive and viable SECaaS delivery model that allows them to maintain control. In addition, this paper discusses the impact of the changing threat landscape on SMBs, as well as the opportunities for CSPs to address SMB requirements through the introduction of SECaaS managed services. Further, the paper documents the interworking of the Domain Name System (DNS) and Big Data and Analytics (BDA) systems to deliver robust and effective SECaaS.